The best visual presentation of the verbose output is obtained by using the option -html to produce HTML output which may then be viewed in a web browser. You can find details on how to show TeXcount output in a web browser in the FAQ. The HTML output produced by TeXcount is the same as that produced by the web interface. If you are using a Unix based OS, e.g. Linux or MacOSX, your terminal window most likely supports ANSI colour codes. This allows TeXcount to colour code the output details to indicate how different words, macros and environments have been interpreted. Note that the output, as for the HTML output, contains three parts. 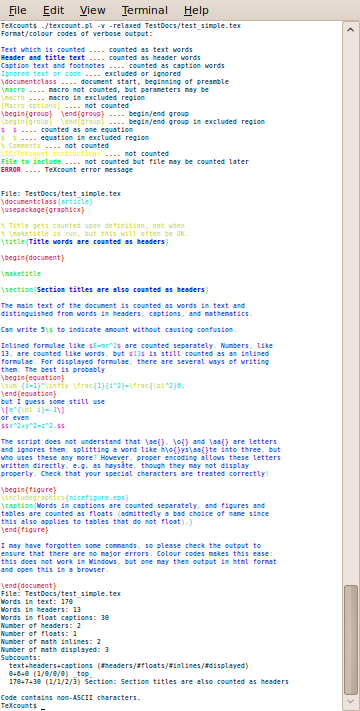 First an overview of the displayed interpretations, then follows the parsing details for the document, and finally the summary of the word count. If you use Windows, ANSI codes most likely do not work and are turned off by default. Instead, you should output the parsing details to HTML using the -html option and view this in a web browser. Still, you can output without parsing details to only get the summary. Alternatively, you may run it with reduced parsing details (-v1) to get a quick overview of which parts of the document are counted. Last modified January 29, 2017.